A special land acquisition officer and another person named by his driver in a note before allegedly committing suicide last week, have been arrested by the Mandya Police on Sunday. Ramesh K C had allegedly committed suicide by consuming poison at a lodge at Maddur in Mandya district on December 6, leaving a note in which he has listed out alleged illegalities committed by Bheema Nayak, special land acquisition officer (Bengaluru) and held him and his personal driver Mohammad responsible for his death. 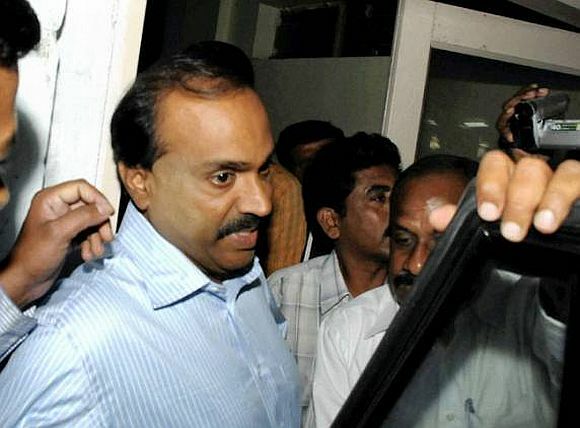 Ramesh had also alleged that there was a threat to his life as he was in the know of the illegalities allegedly committed by the officer and how he got money converted into white for the wedding of mining baron G Janardhan Reddy’s daughter recently. “Mandya Police team has arrested Bheema Nayak and Mohammad from a relative’s house today,” police said. The note claims that Reddy had got Rs 100 crore converted into white money for his daughter’s marriage with the help of Nayak. “He (Nayak) had got converted Rs 1000 and 500 notes belonging to them (Reddy) worth Rs 100 crores for 20 per cent (commission) to Rs 50, 100 and 2000 notes. As I was aware of all these things, they had threatened me of dire consequences and told me they will get me killed from rowdies,” the note claimed. Mandya Police, which had registered a case under section 306 of the IPC (abetment of suicide), had formed three teams to look into the suicide of Ramesh. The Criminal Investigation Department is also probing the case.